First Class Accommodations in the Texas Hill Country! 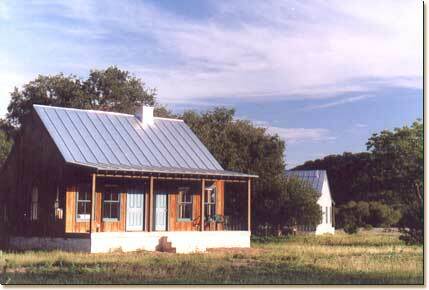 Early Texas style accommodations, built of native limestone and cedar, echo the homes of the sturdy German and Polish immigrants who settled the region in days gone by, while providing guests luxurious sanctuary from the rigors of modern-day life. Strategically nestled among the oaks in the valley, and perched among the junipers along the hillsides to provide ultimate privacy, each accommodation welcomes guests with oak floors, central air and heat, and abundant wood-sash windows and spacious porches from which to take in the views of the surrounding countryside. 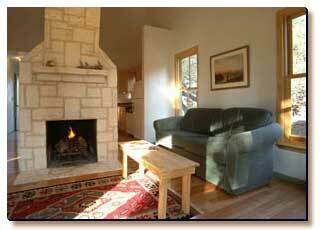 Hill Country Equestrian Lodge offers two types of accommodations, Private Cabins and Suites. Private Cabins feature bedroom, sunroom (which can be used as a second bedroom), two bathrooms, and a living/kitchen/dining room with cathedral ceiling and 22 foot tall limestone fireplace in the center of the room. Kitchen is fully equipped, and living room has a sleeper sofa. Call or email us for current rates. 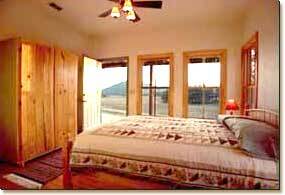 Suites feature bedroom, sunroom, (which can be used as a second bedroom), kitchen, (fully equipped), and bathroom. All nightly rates include breakfast foods, stocked in your accommodation. For lunch and dinner, guests have a number of options. They may bring their favorite foods and prepare them in the fully equipped kitchen of their accommodation, or grill outside. Nearby, Bandera invites guests to sample its diverse selection of restaurants. 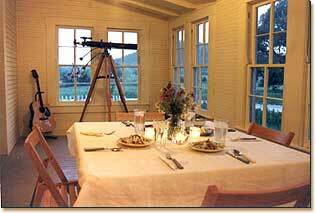 Or, for an additional fee, guests may enjoy lunch or dinner, (served by candlelight), in the dining room of the ranch house headquarters. Catered meals can also be provided for groups.